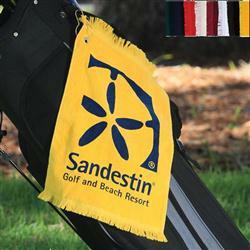 One of our most popular promotional golf towels! 11” x 17” in size with a 1.3lb./doz. weight. A terry velour, fringed, 100% cotton towel. Includes grommet and hook as shown. Tri-fold available. Colors Available: Navy Blue, Royabl Blue, Hunter Green, Burgundy, Red, Gold, Natural, Black and White. Available Colors: Colors Available: Navy Blue, Royal Blue, Hunter Green, Burgundy, Red, Gold, Natural, Black and White. 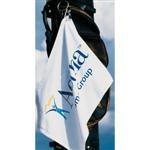 3-DAY RUSH PRODUCTION AVAILABLE - PLEASE INQUIRE! Typical Imprint Area(s): 8" x 13"
Available Imprint Options: Screen Print. Embroidery Available - Inquire. 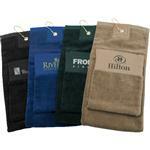 11” x 17”, 1.3lb./doz., terry velour, fringed, 100% cotton towel. Includes grommet and hook. 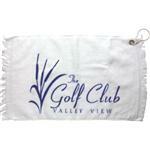 White Signature Turkish Heavyweight Custom Golf Towel 12" x 17"